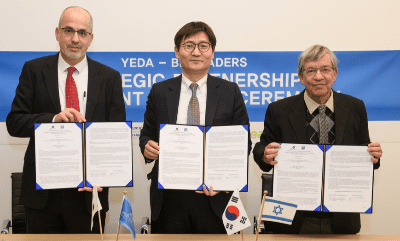 Two South Korean concerns have committed to investing a total of $12 million in spinout companies incorporated by Yeda Research and Development Co. Ltd., the technology transfer arm of the Weizmann Institute of Science. The first investment, in the amount of $2 million, is being invested by Yozma Group Asia in On-Sight Medical Inc., jointly owned by Yeda, New York University (NYU) and related parties. The Korean group BioLeaders Corporation, in which Yozma Group Asia is an investor, has committed to investing $10 million in a new spinout which will develop an anti-cancer therapy developed by Institute scientists. The agreements were launched this week in a special ceremony held at the Weizmann Institute of Science with Yozma Group Asia’s Managing Partner, Mr. Wonjae Lee; BioLeaders’ CEO, Dr. Young-Chul Park; the Institute’s President, Prof. Daniel Zajfman, its Vice President for Technology Transfer, Prof. Mordechai Sheves; and Yeda’s CEO, Gil Granot-Mayer. On-Sight Medical Inc., a joint initiative of the Institute and NYU Medical School, is developing a program that will allow untrained users to operate ultrasound equipment and interpret the results. Today’s ultrasound machines are compact and economical, but they still require highly trained and experienced technicians. The developers of the new program hope not only to make up for the lack of qualified ultrasound technicians and radiologists but also to facilitate the use of ultrasound technology in ambulances, general practitioners’ offices and even in home care. This initiative received the first place award last year in the Echovation Challenge of the American Society of Echocardiography. The first venue for the application of On-Sight Medical’s technology is in emergency rooms, where waiting for the technician can waste crucial time. Based on a mixture of artificial intelligence, machine learning and algorithms for geometric recognition, the program was developed by the group of Prof. Yaron Lipman of the Weizmann Institute’s Computer Science and Applied Mathematics Department together with Achi Ludomirsky, MD, a pediatric cardiology expert at NYU School of Medicine, Itay Kezurer, the company’s future CTO, and Dr. Yoram Eshel, the company’s CEO. Yeda also participated in the present round of investment in the company. BioLeaders signed a Letter of Intent with Yeda for the incorporation of a jointly owned company that will be established in the coming months to develop an anti-cancer drug. The drug will be based on the research of Weizmann Institute Profs. Varda Rotter and Moshe Oren, both of the Molecular Cell Biology Department. Profs. Rotter and Oren were among the very first to have discovered the function of the p53 protein – the “guardian of the genome.” This protein is mutated or dysfunctional in over two-thirds of all cancers; such malfunctions can cause cancer to spread faster. The two researchers recently developed a peptide – a small piece of protein – that can restore proper p53 function. The peptide they developed is targeted to the malformed p53, and it easily enters the cell and binds to the protein. In mice carrying human tumours that were treated with the peptide, the tumours shrank and in some cases disappeared altogether, with no significant side effects. The investment is planned to be completed in the coming months, and the company is expected to establish operations and recruit staff in its headquarters in the Kiryat Weizmann Science Park in Ness Ziona, near the Weizmann Institute of Science. 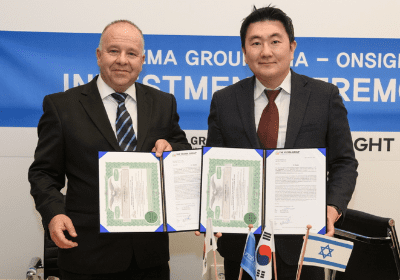 The two investments are the fruits of several years of work on the part of Prof. Sheves and Mr. Wonjae Lee, the CEO and Managing Partner of Yozma Group Asia, in developing ties between Korea and the Weizmann Institute. Yeda and Yozma Group Asia signed a cooperation agreement in 2016. Yozma Group Asia was founded in 2014 as a venture capital fund based on the “Israeli model.” The original Yozma fund was founded in the 1990s by Yigal Erlich, who was at the time the Chief Scientist of Israel’s Ministry of Industry and Trade. Yozma Group Asia invests in Korean start-ups as well as working to develop strong ties with Israel’s high-tech industry. BioLeaders is a clinical-stage biopharmaceutical company that is traded on the Korea Stock Exchange. This is the company’s first investment in an Israeli venture.